This is where I got my inspiration to make my own powder foundation as well as the eye shadow (tweaked). This is the website to this recipe as well by gittemary.com. Fantastic site I just found. In the beginning I did not have shea butter for a primer. 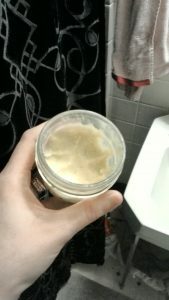 I tried using coconut oil, which I bought at the Bulk Barn in my own container. But the coconut oil does not absorb into the skin very well and left my face pretty . . . wet. The foundation would rub off very easily and then my skin would be blotchy. So no go with the coconut oil as a primer! 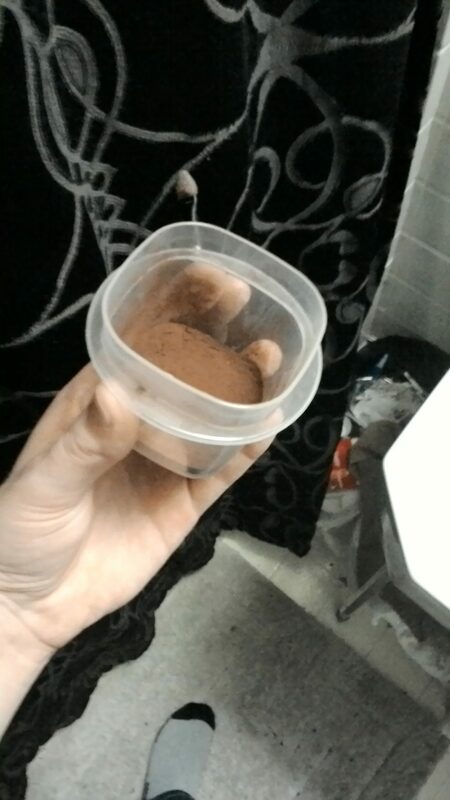 3 Tbsp Arrowroot powder, 1/2 tsp cocoa powder and cinnamon each. I went a long time with just the powder and no primer. 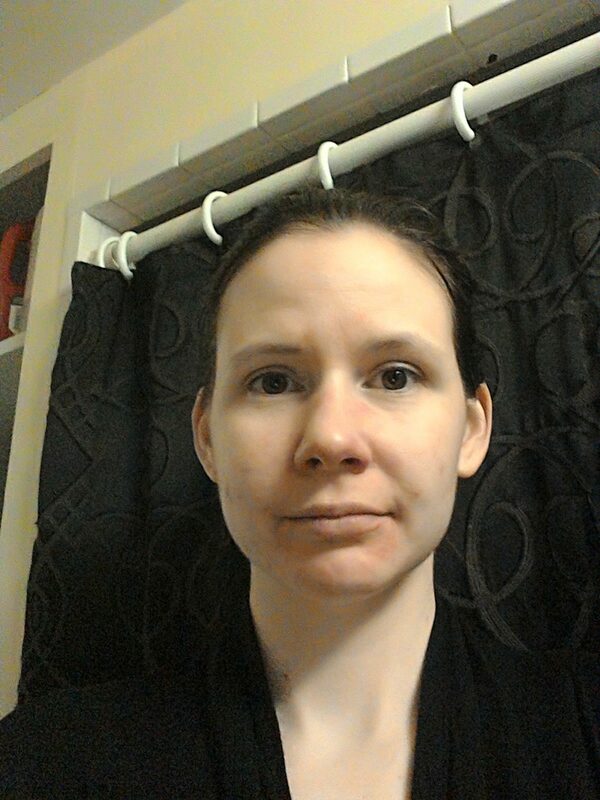 It was fine, but not the same as a liquid foundation for sure (which is what I was used to). 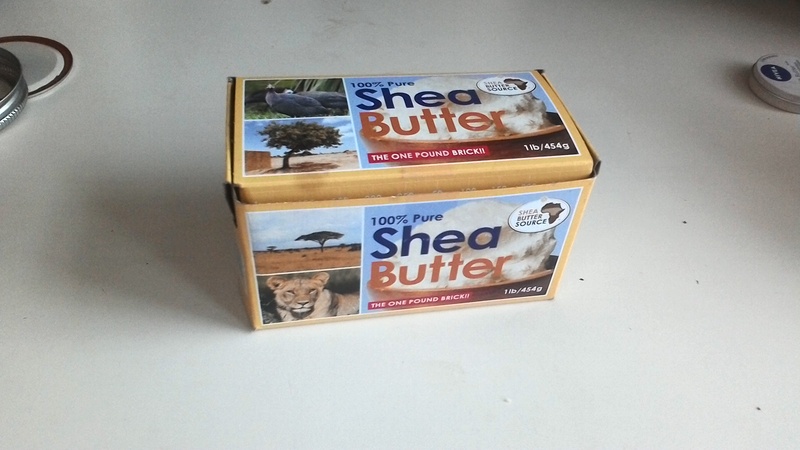 I found a vendor at The Farmer’s Market a few weeks ago who sells shea butter. All the way from Africa. 1 pound for $28.00 in a cardboard box or a container with a .5 pound for $15.00. Of course, I avoided the container without thinking about it! I whipped up a small portion, 1/8 of a cup or so. I use that as my primer. I tell you, what a difference! Primer is definitely a need. The powder foundation blends onto the skin so nice! Its also a great lip balm for a final touch. (I would love to add some colour to it, like beet). I must mention, I do not use a concealer. I need to lighten the recipe in the video for my skin colour otherwise I have dark patches. I just have not gotten around to that. I must say I am no make-up expert. I have never used concealer, so I am unaware of the benefits, really. I also do not use the bronzer (cocoa powder), as I find it leaves blotches on top of the foundation. It just does not blend so well. I am not sure why. Though, it was fine without the shea butter primer. (I never used bronzer anyways). 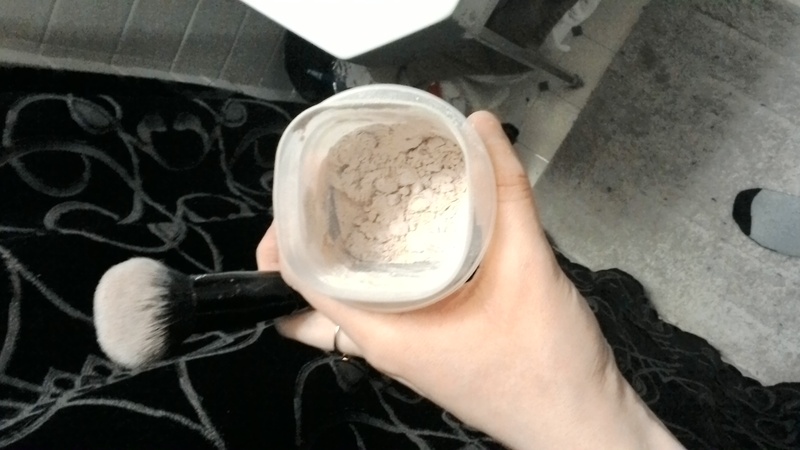 For the eye shadow, I found straight up cocoa powder was not dark enough. I found some superior red cocoa powder at Bulk Barn, and that is what I am using. 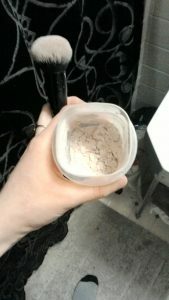 I take my applicator and sweep off the particles off the side of the container, so I can collect a small amount at a time, rather than sticking the applicator in the cocoa directly (too much). I have not yet found an eye liner, mascara or eyebrow pencil replacement. I will be doing some more researching soon and asking some helpful people I have been in contact with on different groups online. 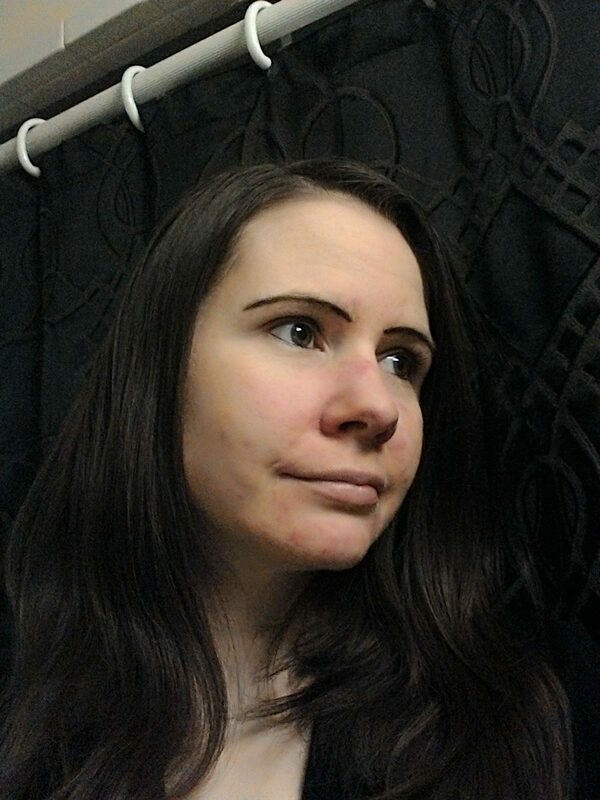 I feel I should go see a professional make-up artist and get some “how to” tips. I took a break and further researched the link above and found this mascara recipe. Interesting! I have seen recipes calling for aloe vera gel before, and my first thoughts was to get a aloe vera plant too. Yes! She says something about using almonds to make activated charcoal . . . Must research that one. I did find a container of activated charcoal at Superstore a few weeks ago, and it says to keep away from eyes . . . so that needs more investigation. As you can see, there is no rushing this process. Rushing will result in mistakes and waste (product and money). Something my husband has taught me. My commercial mascara is running out and needs to be replaced, now, but, if anything, I will just do without until I can make some. easy as that. ( I will save the old container and applicator to refill in the future). A me sure to watch the video and read the site I posted above. I left some things out for my own routine.